In the spirit of merriment and mayhem, tomfoolery and togetherness we present the Scallywag Party 2019 festival warm up night. 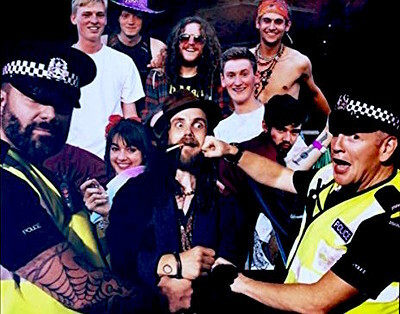 It’s March, it’s cold but Duncan Disorderly and the Scallywags are gonna bring you the warmth of summer as they cram loads of good time festival vibes into one very special evening. Expect jump up gypsy, swing, hip hop, reggae & rumba as these festival favourites take you on a journey and create a little slice of what’s to come at the Scallywag Party 2019 this summer. The Scallywags are turning the the Golden Lion into one great colourful festival party with décor from the festival and lots of Scallywag Party flavoured treats as well as special festival ticket offers too. Come warm yourselves, have a jolly good knees up and help us beckon the summer in nice and early! THIS IS A LAUNCH NIGHT FOR THE SCALLYWAG PARTY 2019, 14 - 16th JUNE, a pocket sized festival near Bath full of close friends you're yet to meet! check out the event and come join the party.